100% satisfied with the quality of my trees. They are full an perfect. Great job. This is my second order of 100 trees. it much better than my last order of 150 trees. Because my order was whole sale order, no gurantee and non refundable, despite they send me very poor quality tree. After I complaint to them, the second order was much better: rigtht size and green. 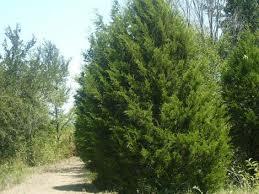 Cedar Trees are a coniferous evergreen that is hardy in most areas of the country. They proliferate and can reach over 100 feet. These trees need moisture to get established but are generally easy keepers. It is advised to protect the trunks until established. If you need a windbreak on your property, these trees are ideal in most situations. The wood is aromatic and resists most insect invasions. Red Cedar Tree, also known as the Eastern Red Cedar, Virginian Juniper, and Eastern Juniper, is a common sight around the eastern half of North America. Red Cedar is quite tolerant to heat and salt, and thus thrives in a diverse variety of soil types. Red Cedar Trees are particularly tolerant of various soil types but prefer dry soils over moist soils. As a result of this hardiness, Red Cedar Trees can be found as windbreaks along farms and even in cities as beautiful street trees and hedges. Red Cedar Trees can withstand temperatures as low as -45 degrees Fahrenheit to temperatures well above 100 degrees Fahrenheit. Red Cedars grow at a moderate rate of 13-24” per year and prefer full sun for maximum growth potential. Red Cedar Trees develop deep roots and are typically pyramidal or cone-shaped in maturity. The evergreen foliage is scale-like and develops rounded, four-sided branches. Red Cedar Trees in the wild have lived over 900 years! Red Cedar Trees are dioecious in that their flowers have a specific gender (pollen or seed). The berries are dark purple or blue and are an extremely important dietary food for wildlife during cold winters. Red Cedar oil is condensed from the beans and used to flavor gin. Red Cedar lumber is a critical and handy commodity as well—the timber is lightweight and rot resistant and ideal for fence posts and any other lumber use that comes in contact with soil. Red Cedar Trees are incredibly aromatic, giving off a comforting fragrance from the little berries they produce.